People throughout NLM recently had a chance to meet and mingle with the new class of Associate Fellows—a diverse group whose backgrounds and interests include professional counseling, teaching biology, sleep research, and Islamic art and architecture. In keeping with tradition, alumni Associates now working at NLM hosted a welcoming reception for the new class shortly after they arrived last month. 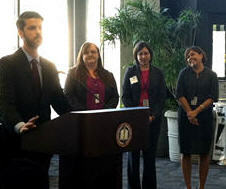 The Associates, who each briefly took the podium, said they were happy and honored to be at NLM and eager to explore areas such as electronic medical records, social media, and mobile health. “Being part of this program has been my singular goal since I first heard about medical librarianship,” said RoseMary Hedberg. Joyce Backus, NLM Acting Associate Director of Library Operations, told the Associates they will work hard and learn a lot over the next year. “Our promise to you in setting high expectations is that we are committed to your success.” Backus started her career at NLM as an Associate Fellow. The Associates will spend the first part of their program in the classroom, learning from staff throughout the Library about all aspects of NLM. Then, they’ll move on to special projects, field trips, and other learning experiences. The NLM Associate Fellowship Program is designed to prepare librarians for future leadership roles in health sciences libraries and in health services research. Applications for the 2013-2014 year will be accepted until February 1, 2013. The 2012-2013 class comes from across the United States and Canada. Diana Almader-Douglas received her MA in information resources and library science from the University of Arizona, Tucson. She was awarded a Knowledge River Scholarship to educate information professionals on issues pertaining to Latino and Native American populations. While completing her degree, she was worked as a graduate assistant at the Arizona Health Sciences Library and as a student affiliate at the Southern Arizona VA Health Care System’s medical library. Ms. Almader-Douglas earned a Master of Arts degree in counseling from Webster University and worked as a licensed professional counselor, helping state-funded behavioral health recipients. Ms. Almader-Douglas’ undergraduate degree is from Northern Arizona University, Flagstaff, Ariz., where she majored in psychology. RoseMary Hedberg received her MLIS degree from the School of Information at the University of South Florida, Tampa. While completing her degree, she worked as a graduate research assistant at the All Children’s Hospital Medical Library and volunteered as an intern at the Moffitt Research Center Biomedical Library. She also collaborated with the University of South Florida College of Medicine Bioinformatics and Biostatistics Division, researching the information-seeking behaviors of patients diagnosed with rare diseases. Prior to completing her graduate studies, she worked at a sleep diagnostic and research center as a patient quality assurance coordinator. Ms. Hedberg received her undergraduate degree in psychology from the University of South Florida. Karen Gutzman received her MS degree in library science from the University of North Texas with an emphasis in health informatics. While completing her degree, she worked as a research assistant with the National Children’s Study, which is the largest study of children’s health in the US. She was a recipient of the Medical Library Association scholarship and she completed an internship with the University of Houston’s digital library. Her background includes teaching biology and English in Liptovsky Mikulas, Slovakia and receiving a Master of Arts degree in educational leadership from Luther Seminary in St. Paul, Minn. Ms. Gutzman received her undergraduate degree in biological sciences from South Dakota State University. Kevin Read received his MLIS and MAS from the University of British Columbia (UBC), in Vancouver, Canada. While completing his degrees, Mr. Read worked as a student librarian at the Biomedical Branch and Science and Engineering Branch Libraries. His most recent work has been collaborating with the pediatric palliative network PedPalNET at the British Columbia Children’s and Women’s Health Centre, building a strategy to provide health information to patients’ families, and working with the British Columbia College of Physicians and Surgeons Library as a consultant to improve their Finding Medical Evidence training workshops. He has also worked with the Canadian National Aboriginal Health Organization and the UBC Centre for Healthcare Management to help improve their understanding and use of social media tools to promote health information services. Mr. Read received his BA with honors in Islamic art and architecture from the University of Victoria in Victoria, Canada.